Some patients' memories were wiped. More than 40 years after the notorious MK Ultra program became public knowledge, the CIA’s mind-control program is still shrouded in mystery and unanswered questions. Now, Canadians who became non-consenting test subjects in experiments are seeking closure for the inhumane LSD and electroconvulsive therapy research that left hundreds of psychiatric patients permanently scarred. Despite the well-documented cases of patients who suffered lifelong consequences as a result of the inhumane experiments, the Canadian government has neither accepted responsibility nor apologized for its role in the CIA project. In response to this inaction, a grassroots group of survivors and their families has mobilized to demand an apology and financial compensation for the lifetimes of pain inflicted on unsuspecting victims. The group, called Survivors Allied Against Government Abuse (SAAGA) held a public meeting in May and is currently formulating a class-action lawsuit against the Canadian government, the government of Quebec, and McGill University. From 1943 through 1964, patients at the Allan Memorial Institue, a Canadian psychiatric hospital that’s part of McGill University in Montreal, received experimental treatments under the supervision of D. Ewen Cameron, Ph.D., a psychiatrist who served as president of both the American Psychiatric Association and the Canadian Psychiatric Association. The experiments were funded by the Canadian government — and secretly funded in part by the CIA, through a front organization called the Society for the Investigation of Human Ecology. 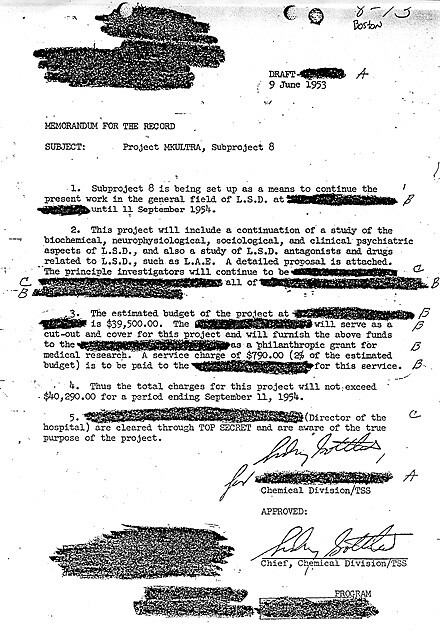 A declassified document describing MK Ultra. Patients admitted for minor psychological conditions like depression or anxiety were unwittingly subjected to experiments involving repeated electroconvulsive therapy, induced comas, and massive doses of psychedelic drugs like LSD and PCP. Cameron’s trademark therapy, known as “psychic driving,” involved putting patients into comas, and playing repetitive phrases on headphones or speakers in an effort to erase thought patterns and heal patients. But the CIA saw the potential for weaponizing the technique. In some cases, patients were left with long-term mood and memory deficits. In general, the MK Ultra program goals involved developing mind control techniques and conditioning soldiers to withstand drug-assisted interrogation, but in the process, psychiatrists wiped some patients’ memories and left others with less debilitating but still long-lasting psychological issues. While the program was officially declassified in 1975, victims and their families are still fighting for the responsible parties to make amends for the lifetimes of pain and suffering. “The government should offer an apology and there should be recognition of the injustice that was done,” Gina Blasbalg, who was a patient at the AMI in 1959, told CBC. Blasbalg and her husband attended a May SAAGA meeting, at which survivors and their family members tearfully shared their experiences. The group formed after news spread that an MK Ultra victim’s family had received a settlement from the Canadian Department of Justice. But the Justice Department also issued a gag order, barring the victim’s family from discussing the out-of-court settlement. “If they hadn’t been confidential and the settlements had the publicity that they should have had, a lot of the victims would have come forward and gone to court,” Alan Stein, a lawyer who’s helping SAAGA arrange the lawsuit, told CBC News in December 2017. Stein described the gag order as just one more move by the government to silence victims after over 40 years of secrecy and deflection. Some patients couldn’t even remember who they were after being discharged from the AMI, leading to years of confusion and difficulty for them and their family members. In a declassified document (above), the CIA acknowledged the need to notify victims but also indicated that this was a moral issue, rather than a legal one. As such, there was no binding responsibility for the agency to do anything. Efforts to receive compensation or even an acknowledgment of harm have been incredibly difficult for victims in the years since MK Ultra documents were declassified. A 1980 lawsuit dragged on for eight years before nine Canadians received only $67,000 each from the US Department of Justice. Stein and the members of SAAGA hope that the new lawsuit will allow people affected by the MK Ultra experiments to find some peace and receive a public acknowledgment that what happened to them was wrong.